This versatile bottle jack is a great addition to any garage and home. The adjustable saddle sets the jack into the perfect position before each lift. The patented design was built with speed and safety in mind. Precision design of the pump and piston permits smooth oil flow to provide the easiest pumping and uniform lifting. The Patented built-in bypass device prevents damage from ram over travel. A grooved steel lifting cap and an adjustable extension screw accommodate work height. For a period of two (2) years from date of purchase, SFA Companies, Inc. will repair or replace, at its option, without charge, any of its products which fails due to a defect in material or workmanship, or which fails to conform to any implied warranty not excluded hereby. 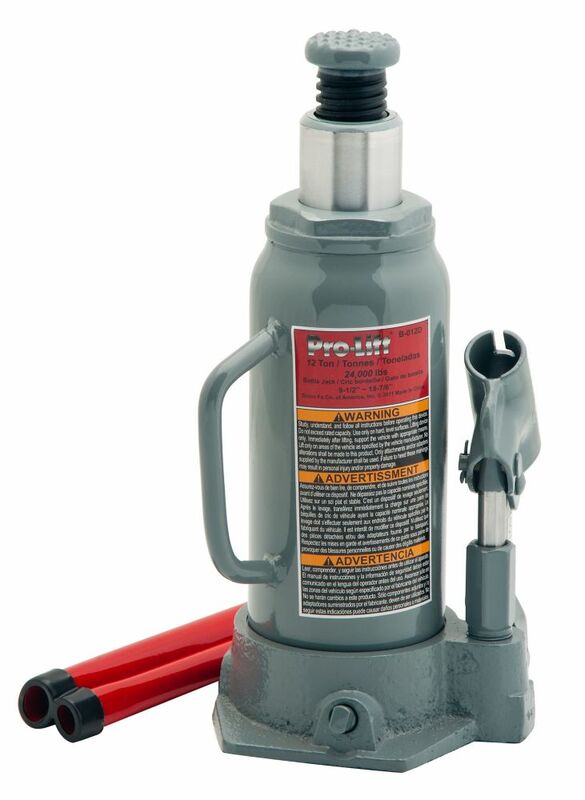 12 Ton Bottle Jack This versatile bottle jack is a great addition to any garage and home. The adjustable saddle sets the jack into the perfect position before each lift. The patented design was built with speed and safety in mind.